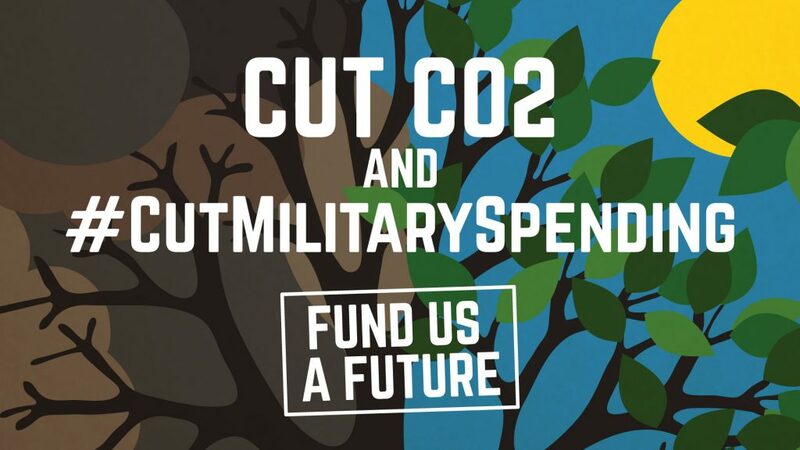 #CutMilitarySpending – Speak up on three military mega-projects. How would your electorate use $36 million per year? The federal government has announced plans to increase military spending. A temporary boost will be added: $200bn to the existing $30bn spent annually. (Australian Government Department of Defence, n.d.). These are only 3 of several projects on the go. You can assert that this is #NotDefence, but instead about facilitating the transfer of massive tax dollars to transnational corporations feeding at the Australian trough. 1/ Submarines: A total of $100bn of taxpayers’ money will go into the construction and maintenance of 12 French-designed submarines. ‘Opportunities’ for Australian industry integration into the supply chain will develop ‘defence capability’ (Financial Review 2018). Submarines: $20 million per electorate, per year. 2/ Jets: 72 F35 Jet Fighters with costs a total of $15.3bn plus $40bn operational costs. Fighters are being made by US weapons corporation Lockheed Martin (DefenceConnect September 2018). Jets: $9 million per electorate, per year. 3/ Ships: $35bn for the construction of naval frigates. BAE systems, a British company, has construction planned for these anti-submarine and anti-aircraft ships. [Costing does not include running costs] (DefenceConnect 2019; DefenceConnect June 2018). Ships: $7 million per electorate, per year. TOTAL: $36million in your electorate alone, per year. How would your electorate use $36million per year? End the Coalition’s plan to make Australia a global arms dealer. “[increasing Defence spending] is pouring public money into the pockets of weapon manufacturers and entering us into a regional arms race. Neither of these things are making us safer.” – Peter Whish-Wilson (2019), Greens Senator. ‘[The Coalition and Labor] support the arbitrary target of defence spending equalling 2% of GDP. Billions of dollars are being thrown at weapons manufacturers with little scrutiny. Many of the government’s costly acquisitions will be obsolete by the time they are deployed. All of this is taking place while the threat of attack on Australia remains unchanged’ (The Greens, 2019). 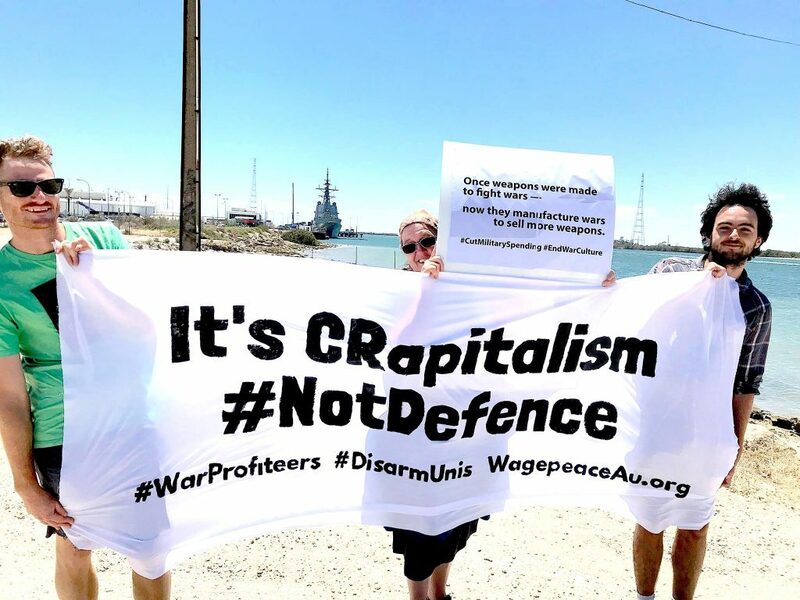 “Australians want peace and global prosperity, not more weapons and war” (The Greens, 2019). Boondoggle: ‘an expensive program that is a waste of money, especially one using public money’ (Cambridge University Press 2019). 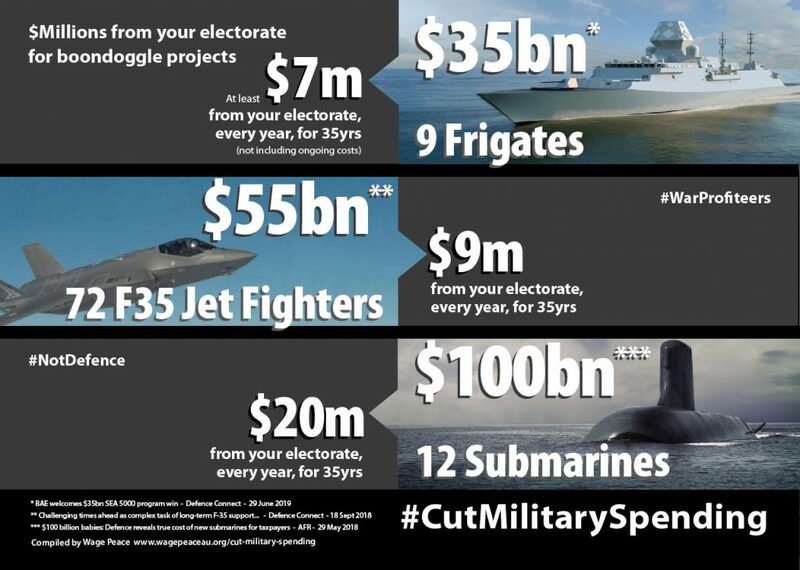 These massive expenditures are inspired by the 2016 Defence White Paper, which reveals plans to increase military funding to $41b (2% of GDP) by 2021, and up to $52b by 2026 (Australian Government Department of Defence, 2016). Few actual physical threats are identified in the paper. Australia is not under threat of attack, and the utility of additional military equipment is highly questionable. This is not a matter of defence. The program will win votes from the South Australian community, whose steel industry will be called upon for the submarine construction (Smart 2016). It is in alignment with the interests of our US allies (The Greens 2019), and provides an excellent way to channel money from public funds into the hands of private industry. 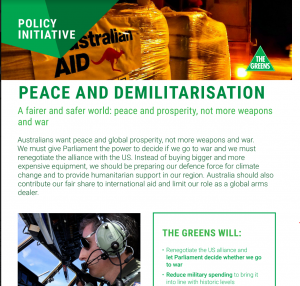 The Australia Greens party aims to create a fairer, more equal society, and has created detailed policy initiatives around peace and demilitarization (The Greens 2019). Our goal is for discussion about these programs to make its way into political discourse. Australian Government Department of Defence, Fact sheet: Defence budget overview (2015-16). Cambridge University Press (2019), Cambridge online dictionary, Cambridge Dictionary online – Boondoggle. Defence Connect (April 2019), Collaboration key to developing shipbuilding innovation and capability by S. Kuper. The Greens (2019), Peace and Demilitarization, Policy initiative plan. Dubbo Weekender G. Smart (May 2016), Boondoggle of the century – so far. .
Greens Media Release. P. Whish-Wilson (2019), Defence projects of concern management creates its own concern.